Antenna Experts manufactures unmanned aerial vehicles antennas for UAV Control Center, Remote Airborne Platform, Unmanned Ground Vehicles and Robots applications. These state-of-the-art antennas enable increased flight range and consistent radio frequency link performance over traditional airborne antennas. Additionally, the wideband antennas reduce the number of required apertures in an airframe, further reducing aerodynamic drag and logistics costs. The antennas that are used on unmanned vehicles are, in general, rugged, dipole or fiberglass collinear antennas with omni-directional coverage. Smaller and lighter weight Unmanned Aerial Vehicles (UAVs) are increasingly being used for more complex communications and intelligence applications. Directional helical antennas have been developed for special ground to air right hand circular (RCP)or left hand cirular (LCP) polarization applications. Standard flange mounting arrangements or roof-top hole are available, however special mounting arrangements can be designed. Durable and robust, every effort is made to ensure the antenna meets the required specification to provide consistent signal coverage between the UAV Vehicles and UAV Control Station / Center. The control centre antenna usually provides the higher gain part of the link and may be a medium to high gain omni - dipoles or collinears, medium to high gain directional helical antenna. 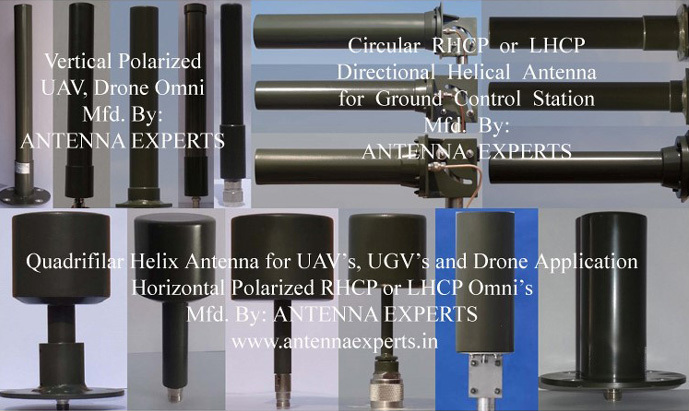 Our Right Hand Circular Polarized (RHCP) Helical antennas are highly suitable for frequency hopping or spread spectrum telemetry system which operated in the 915-928 MHz range and a perfect choice for unmanned aircraft tracking system for UAV telemetry communication link at control center. Our UAH series directional helical antennas are supplied with two-axis steering system (tracking mechanism to rotate the UAVs antennas manually in azimuth and elevation plane). A less complex but compact multi-sector antenna array provides intermediate range coverage for communicating with a UAV. This type of arrangement can be used for quick deployment, tactical applications. QHA Series broadband omni-directional RHCP or LHCP quadrifilar helix UAV, UGV, Drone antennas are rugged all weather model, enclosed in a ABS radome, uses high class copper alloy and does not require any field tuning or adjustments. The compact size of RHCP omni or LHCP omni-directional quadrifilar helix antenna allows easy handling, shipping and highly suitable for receiving, transmitting, scanning, monitoring, surveillance and jamming applications. QHA Series UAV Drone Antenna RHCP omni or LHCP omnis are high suitable as ground station antenna drone communication, drone jamming, GPS communication, GPS jamming application for Ground To Air communication without having the requirement of multiple antennas. These QHA low-profile antennas use Circular Polarization Antenna Technology - which delivers better penetration through obstruction and interference to minimize the effects of multipath interference. Thease commercial grade antenna provides superior performance as compare to significantly larger and more expensive products. QHA Series quadifilar helix antennas available in both circular polarization sense LHCP or RHCP with multiple choice of mounting hardware be it for mast mounting for base station applicable or be it for civilian vehicular mounting application or be it for NATO 4 holes military vehicular mounting application or be it for man-pack application. Other type of mounting hardware / configuration can be supplied on request. QHA Series Quadrifilar Helix Antennas are highly suitable for weather satellite communication, telemetry application, Earth Observation Missions, Space Science Missions, Global Navigation Satellite System GLONASS , L band GPS application including GPS L1, GPS L2 & GPS L5 band without having the requirement of multiple antennas. RHCP omni or LHCP omni antenna termination fitted at bottom of mounting flange for complete weather protection. The special �Teflon Dielectric Transmission Line� technique is used to handle high power handling capacity allowing smooth VSWR and good gain over the specified frequency band. The UV resistant ABS enclosure has excellent transparency for RF signals and enough strength to withstand specified wind loads. The stainless steel mounting hardware is supplied with the antenna. Cylindrical shell/enclosure is used for low wind loading and for minimal effect of ice formation on the antenna operation as well as providing an aesthetically pleasing appearance.